One of my Thanksgiving and Christmas traditions is to make this fabulous, I-always-want-two-pieces-at-a-time Blueberry Pumpkin Poundcake. Well, this week three butternut squashes kept staring me in the face in my fridge, so I decided to make the cake for our small group Christmas party substituting butternut squash instead of the pumpkin. I assumed that it could be substituted easily and without sacrificing amazing flavor. It was a gamble, but I rolled the dice. Guess what? Same ol’ yumminess. So, if you ever have butternut squash staring you in the face, try this recipe and wow your friends with your this amazing cake! For the original recipe, visit this previous post. These are some of our favorite Christmas books, as well as a few new ones that we’re trying this year. What I love about the books below is that they focus on the true meaning of Christmas–Jesus! With all of the competing voices SCREAMING at us during Christmas, my husband and I want to focus our family on Christ at Christmas, and these books have helped us with that. I hope these are helpful. 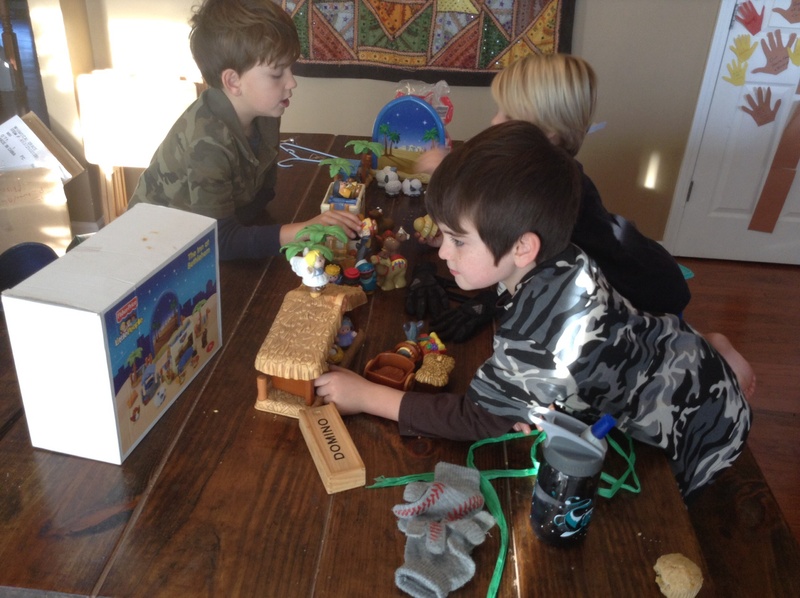 Christmas Came For Easter (Sharon Brunner)- As a parent, I desire for my boys to truly celebrate Jesus at Christmas. However, I feel like I’m leaving out half the story if I don’t tell them the importance of why Christ had to come to earth. He came to earth to live a perfect life so that those who put faith in Christ could take on His perfect life and be justified before God. Without Christ’s perfect life and death, salvation for humanity would not be a reality. So, if we only speak of Christmas, we are teaching only a portion of the story. Christmas came for Easter; it’s true. This short, beautiful book helps the children understand the bridge between Christmas and Easter. As a parent, I LOVE having this book to read with my boys. It is so wonderful to celebrate Christ becoming flesh, living among us, coming to earth. The greatest celebration, though, is His perfect life lived and sacrifice as the penalty for our sins. This is a wonderful, kid-friendly way to delve into this wonderful reality with your children. The Crippled Lamb (Max Lucado)-Is it safe for me to confess that last year was the first time I had read this book (and, consequently, my sons?!?!) Well, shame on me! It is a treasure, treasure, treasure! I had heard of it for years, but we’ve never read it! I know, I know, how tragic! I found it last year at Goodwill (score! ), so I snatched it up. It’s the best $0.99 I’ve ever spent! You must read it this year! One Shining Star: A Christmas Counting Book (Anne Kennedy)-Between 18 and 24 months, my oldest son had 3 books that he wanted read to him every day before naptime. This book was one of them. No, he didn’t care if it was before or after Christmas. 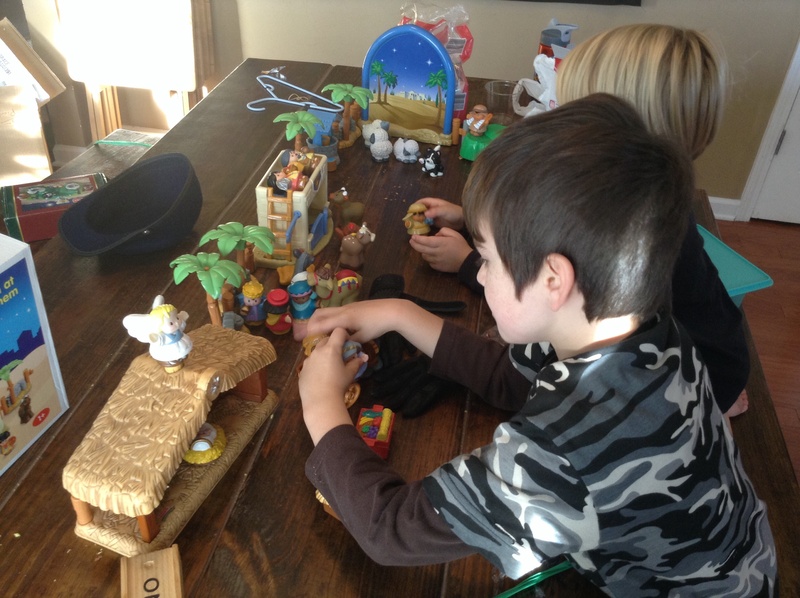 The story goes from 1 to 10 with different elements of the Christmas story. I have this book memorized. There are such sweet memories attached to it. Who is Coming to Our House? (Joseph Slate)-This book is a delight! It’s written from the perspective of the animals in the stable. 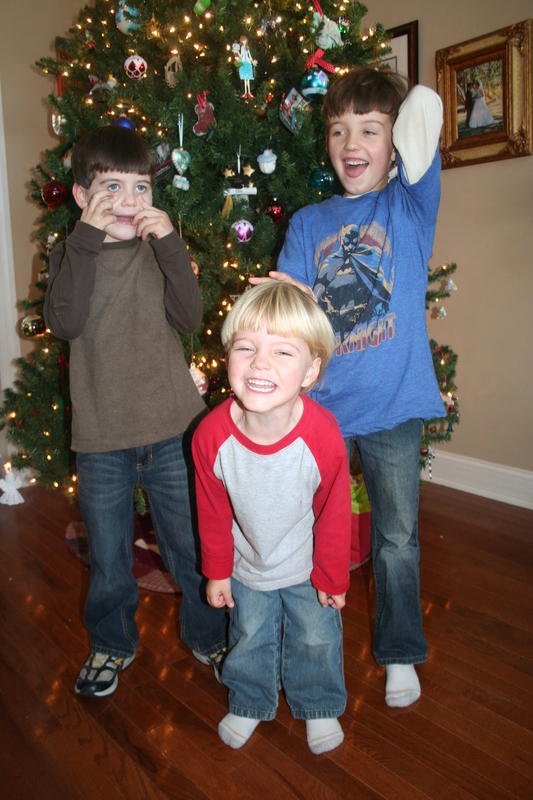 They’re wondering who’s coming to their house…and what a joy when it’s Jesus! Come and See: A Christmas Story (Monica Mayper)–I love the simplicity of this book. I love that each character is repeating the refrain, “Come and See!” Can you imagine beholding Jesus?!?!? Wow! “The Legend Of” books (The Legend of the Candy Cane, Christmas Tree, St. Nicholas)-I love this series of books! As with most things, the origin of objects, traditions, etc. are usually lost over time. I love that these books do an excellent job of unearthing where certain Christmas “staples” originate. Did you know that St. Nicholas was a real person!?!? Do you know what the colors of the candy cane represent? Do you know where the tradition of the Christmas tree started? If not, you should read these books! The Best Thing About Christmas (Christine Tangvald)-If you’ve never read any of the Happy Day books , I encourage you to check them out! They’re written from a Christian perspective. They have some GREAT books on the various holidays (We love their Halloween book, Let’s Shine Jesus Light on Halloween). This book is wonderful as it focuses on the greatest thing about Christmas–Jesus! Pine Tree Parable (Liz Curtis Higgs)-If you haven’t read any of the 4 books in Liz Curtis Higgs’ Parable Series , you should! This one is set on a Christmas tree farm and has a beautiful Christmas message. Jesus, Me, and My Christmas Tree (Crystal Bowman)-I love all of Crystal Bowman’s books ! 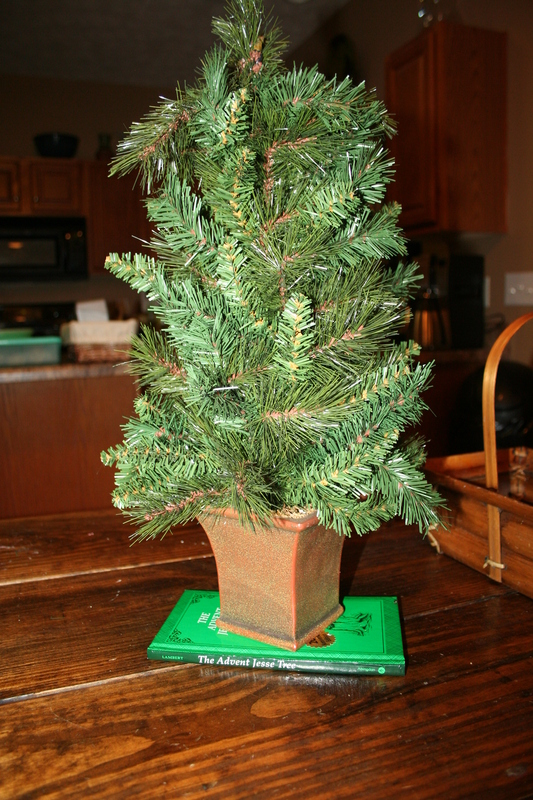 This is another fun book that unearths the origin of the Christmas tree…in a fun, fun way! A Christmas Carol (Charles Dickens)-Focus on the Family Radio Theater Series We LOVE the Focus on the Family Radio Theater audiobooks . (The Chronicles of Narnia is our favorite!!!) These audiobooks are not someone reading the book–BORING! They are fully, dramatized versions of the book; each character has a different actor/actress. It’s amazing! If you’re audiobook fans, check out this version of the Dickens classic. I’m a little bit obsessed with A Christmas Carol, so we also read the children’s version of the book and watch it on DVD each year. We read the Little Creatures version above of the Dickens classic the past 2 years. I loved that the story and message was clearly conveyed, but it was also in a concise form so that I could read it to the boys in one sitting. We also have a tradition of watching The Muppet Christmas Carol on DVD during December as well. Song of the Stars (Sally Lloyd-Jones)- This book is written by the author of one of our favorite Children’s Bibles (click here to read my post about our favorite Children’s Bibles! ), The Jesus Storybook Bible . I love her writing! We read this last year, and it was a hit! The Little Drummer Boy (Ezra Jack Keats)-I love this story AND I love Ezra Jack Keats. Last year was our first year to read this classic, and we all enjoyed this book. Ezra Jack Keats is a timeless author, and this is a timeless story. Add it to your reading list this year! Jotham’s Journey (Arnold Ytreeide)–A friend suggested this book to us last year, and I never got around to buying it. Our library didn’t have it. 😦 I broke down and bought it this year. We are DEFINITELY reading it this year! I also bought the other two Advent books by the same author, Tabitha’s Travels and Bartholomew’s Passage as well. I can’t wait to dive into these books! What are your favorite Christmas books?!?!? I am always looking for new books to read with my boys! Is your Advent Calendar ready?!?! If not, huddle up–here’s your PEP TALK! My sons are cheering for you! This is the year to celebrate Advent! 1-2-3 GO! I’m pulling this out of last year’s archives. Christmas snuck has sneaked up on me, hasn’t it you?!?! I’m still full from my Thanksgiving meal yesterday, but I’ve quickly gotta shift out of “Thanksgiving” mode and focus on Christmas. My 2 Advent Calendars are starting in 48 hours. Whew! Ready, set, Christmas here we come! Have you been googling “Advent Calendars” or perusing everyone’s ideas on Pinterest because you were wanting to start one this year? You may be thinking, “Well, it’s November 28, which means I have 2 more days to get this Advent Calendar made. In other words, that is too daunting of a task. I’ll do it next year.” Let me guess, last year you said, “I’ll do it next year,” and you haven’t made one yet. Or, are you’re lamenting the fact that you didn’t get to make your Advent Calendar made over the Thanksgiving holidays? No, I’m not a mind reader or psychic. I just know these things…because that’s how my mind works. So, lament no longer; it’s not too late! 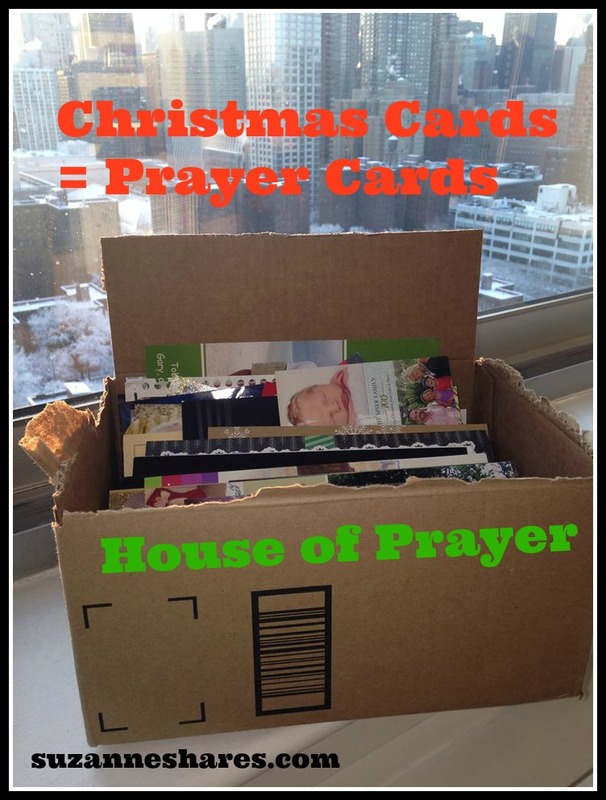 Here are simple steps to get your Advent Calendar made for this year! DIY: YOU CAN DO IT! There is still time! You can do it! 1) First, download the script from the Noel Piper Advent Calendar on her blog here. In the script you will learn what objects/images you’ll need for your calendar. 2) Second, decide how you’ll layout your calendar and your images/objects for your Advent Calendar. Option A: You can download the patterns from the HeartFELT version of the Noel Piper calendar on her site. Isn’t that so awesome of her to have her felt patterns for the Advent Calendar available FREE?!?! ?Or, you can buy her complete Advent Calendar on her Etsy shop. Option B: Make your own. THINK SIMPLE! If you’re not up for making the felt set, you can print images of each needed item on Google Images. Use a poster board, divide the board into a stable scene on the top 2/3 of the posterboard with 25 different sections on the bottom 1/3 of the poster board. Or, get your kiddos involved! Have them help you make the different 25 ornaments needed. 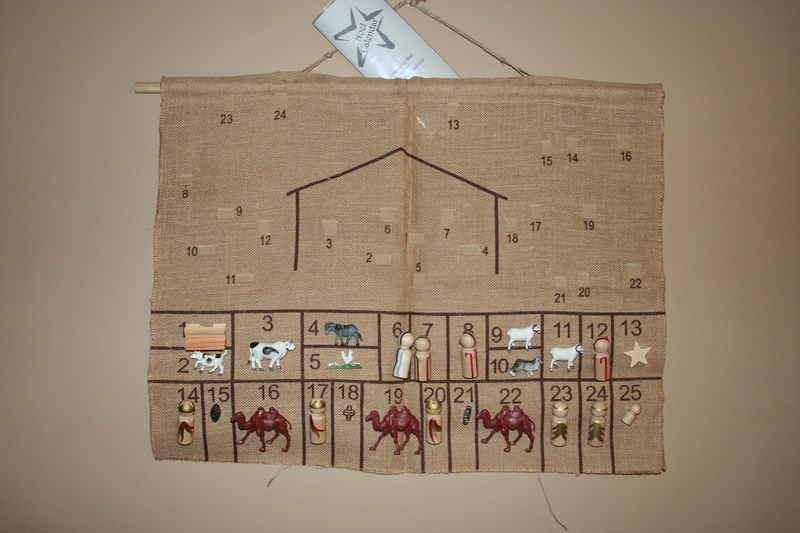 Look at my picture of our Noel Piper Advent Calendar above to get an idea of how you can lay it out on a poster board, burlap, etc. 2) Second, download my document: Advent Jesse Tree ornaments, which lists all of the ornaments that you’ll need for your Advent Jesse Tree. 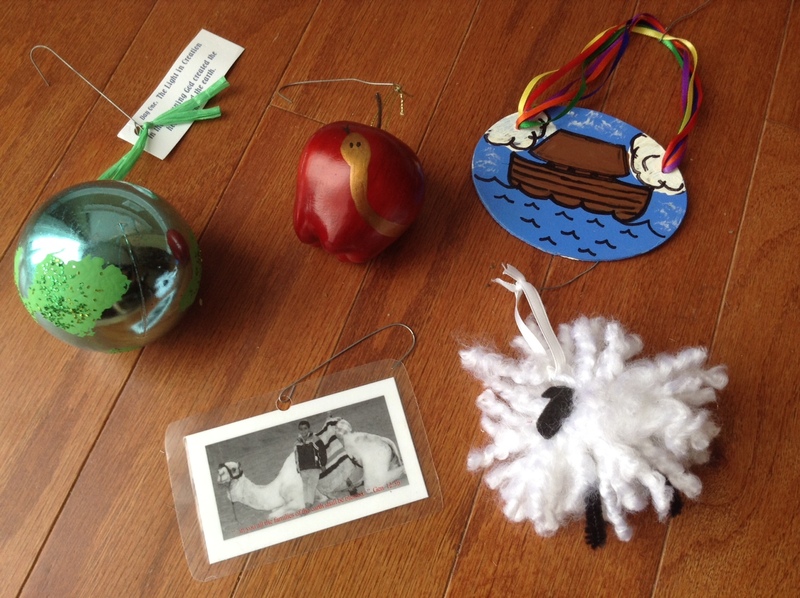 Option A: Go to this post and see pictures of my 25 ornaments and let them inspire your creative juices to make your own. Option B: Use Google Images, old magazines, have your children draw pictures, get creative! 4) Find something to hang your ornaments on. We use a mini Christmas tree. I have friends who use a tree limb in a jar/flower pot. Again, get creative! 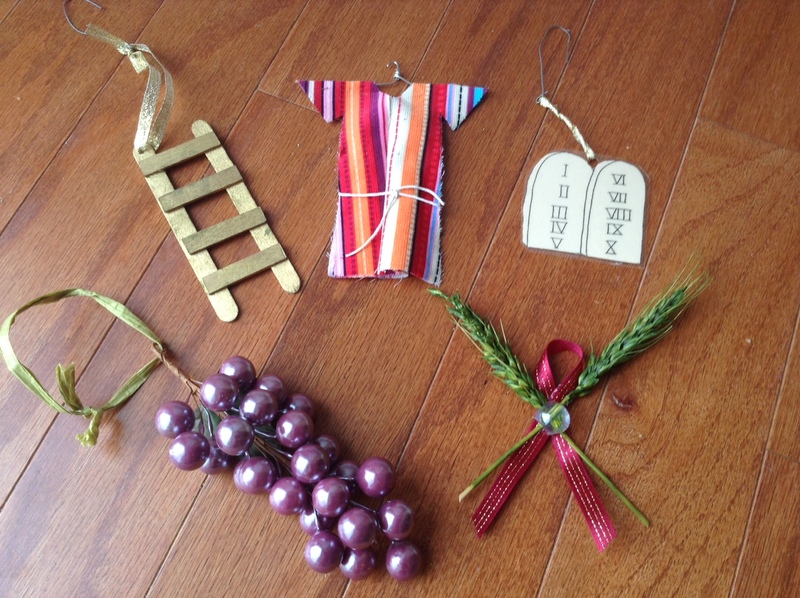 Our Advent Jesse Tree…waiting patiently to be adorned with ornaments! Question: How do you eat an elephant? Answer: One bite at a time. This old adage is true of a DIY Advent Calendar. Take it one ornament at a time. 🙂 Here are some practical steps that you can take to be well on your way to having your own Advent Calendar this year! 1) Set small goals-I have 3 small children at home, so I know that I would NEVER START making 25 ornaments if I knew I had to get it done in the next 48 hours. That task seems too overwhelming. The good news is that you DON’T have to make 25 ornaments in 48 hours. You really only need to make one! Why not just try to make the first 6 ornaments between now and Friday? After all, you only need ornament #1 by Sunday! Once you get the first 6 done, set your goal to make the next 6 before December 6, the following 6 by December 12, and the last 7 by December 18. Or, if that’s too overwhelming, you simply only have to stay ONE DAY ahead! Do ornament #2 on Saturday before you’ll need it Sunday. Or, have your kids have “Advent Craft Time” each day starting Saturday. Have them make the ornament the morning that you’ll need it, and then it’s ready to use that night! YOU CAN DO IT! YOU CAN DO IT! 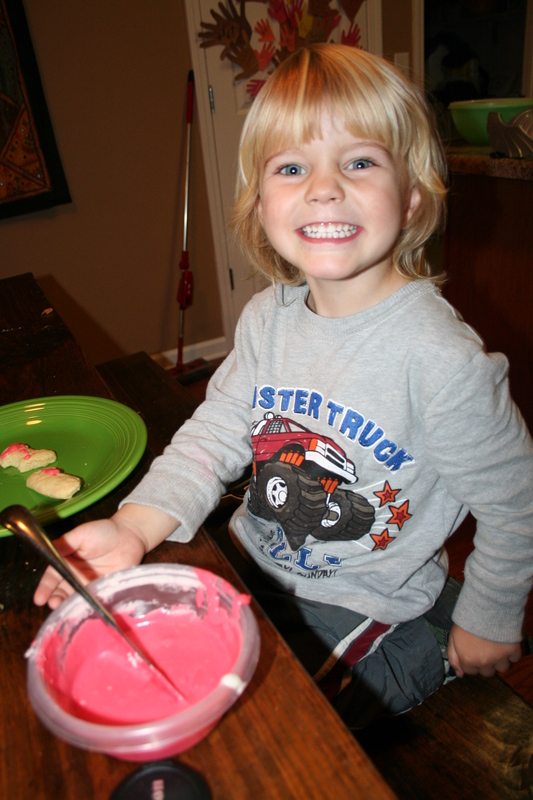 2) Involve your children-My sons LOVE art projects! If I gave them the types of ornaments needed and gave them a half hour each day over the next 72 hours, they would have all 25 ornaments made! They wouldn’t be perfectly neat and tidy ornaments. They may not even look anything LIKE the object they’re supposed to be. However, you would have your 25 ornaments done, and you would have children who are EAGER to do the Advent Calendar each night because they have a stake, a vested interest in it. After all, they made the ornaments! 3) Just do it! No, this is not a Nike commercial! I’m still talking about the Advent calendars! I LOVE, LOVE, LOVE Advent Calendars. They are used by God in my own heart to focus me DAILY on the meaning of Christmas. As I said earlier, so many other competing voices vie for my attention during the Christmas season (and many of them GOOD things!). I love that the Advent Calendars in our home re-focus my heart, mind, soul on Christ. My heart is prone to wander; I need our Advent Calendars at Christmas. So, if you’ve been toying with the idea of starting this wonderful tradition in your home this year–JUST DO IT! Your calendar doesn’t have to be cute, perfect and beautiful BEFORE YOU or IN ORDER TO start. Just start!! You won’t regret it! You won’t regret the time you spend together as a family at Christmas. You won’t regret the time you spend together around God’s Word at Christmas. (Have I convinced you yet?!?!) I see the difference, the eternal fruit of Advent Calendars in our home; you will too! Go for it! Come back and let me know how you’re enjoying your Advent Calendar! If an Advent Calendar isn’t going to work for you, go to this post to see a schedule of Advent Readings with the Jesus Storybook Bible (one of our favorites!). Our check out this post with several book recommendations with daily Advent Readings. No matter what you do, celebrate Christ this Christmas by centering your heart, soul, mind and calendar around the Word each day of Advent! Come back and let me hear how it’s going! Thanks for joining us today as we begin discussing Treasuring God in Our Traditions . I warned you yesterday that my one blog post….expanded into several. I’m glad that didn’t scare you off! Thanks for stopping by! This 2nd reading of Treasuring God in Our Traditions reminded me of the reality that my children are always learning, being shaped by their experiences and the messages they hear from media, friends, etc. In fact, not just my children, but I am likewise. If I am not infiltrating my life with God and aiming to infiltrate my sons’ lives with God, my life and theirs will be infiltrated with something else. Therefore, upon reading #2 of Treasuring God in Our Traditions, my heart was stirred and rekindled to plan and be proactive in my own pursuit of being conformed to the image of Christ and in instructing and having conversations with my children about God. Gheez, this is not rocket science, but I, too, get so bombarded with the noise of our world and culture that I am sporadic about infiltrating my life, mind, heart with Christ and His Word and with my kiddos’ lives as well. I become hypnotized and drunk on the world’s siren song–equating busyness with Godliness or substituting going to church as discipleship–that I forget that my number one goal and my number one goal for my sons should be to know and love God. This re-calibrating that I need daily can happen through His Word; my children and myself need this daily injection of the Word to keep us focused on Christ. If I’m not proactively planning time in our day to hear the Word and to pass Christ along to the next generation that lives under my roof, the minutes will be stolen by other things. Obviously, this is my daily goal and the daily goal with our children, but my struggle is with consistency. This second reading of Treasuring God in Our Traditions reminded me of the necessity of consistency. I am walking away with this “nugget” of wisdom and praying for God to aide me in being consistent. Piper uses Deuteronomy 11, particularly verse 1, as a thread throughout the book to remind us of the necessity to proactively instruct the next generation about God. Notice what Deuteronomy 11 doesn’t say. It doesn’t say, “You parents teach them to your children…” It says, “You.” The Deuteronomy 11 charge was for all of Israel–single, married with no kids, married with young kids, married with grown kids–to teach the children about God because the adults were the one who had first-hand experience with God. Verse 2 highlights the fact that the children had not seen or known of the mighty acts of God; they were either too young or had not been born. All the “grown ups” in Israel were given the task of passing on to the next generation the mighty and glorious works of God. Sadly, that didn’t always happen. 8 years ago when first digesting the book, I was reading it simply wearing my “new-mother-I-don’t-want-to-screw-up-my-kids” hat. As I get older (remember, my son has written about my brown and silver hair) and my children get older, I am reading it again with different eyes. All of Israel was commanded to teach the next generation about God. I won’t “outgrow” the opportunity and responsibility to teach children within my church, neighborhood, school; I had not thought of this previously. So thankful for this instruction and reminder coupled with the reality that I need to be proactively planning ways to pass along to the next generation the mighty works of God. What about you? What examples can you share with us about how you are proactive with instruction of your children or children in your life? Join us tomorrow as we talk more about “Everyday” and “Especially” traditions.